The Sisters of Adoration and Reparation were founded in Paris in 1848 by Théodelindé Dubouche who is known now as Mother Marie Thérèse. The congregation came to Belfast in 1980 before founding St Aidan’s Monastery in Ferns, Co Wexford in 1990. In the Convent in Belfast they have perpetual adoration since 1980. 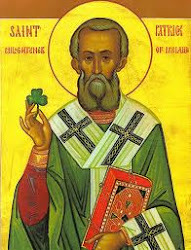 It is a powerhouse of prayer and intercession for Ireland and for the world. The Christian Institute is backing this case which proves the need for the law to reasonably accommodate family-run businesses with firmly held beliefs. May God bless them for their courage and for standing by their beliefs. These people who wanted this cake could have easily gone somewhere else but no, they choose to force their agenda on others. It seems like free speech, liberty and all that goes with that in our world today, does not include those who wish to practice their faith. So it isn't really a democratic society we live in at all, actually. 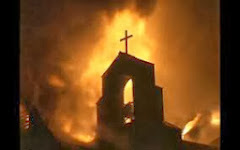 Christians and those of other Faiths are now being demonised and persecuted by liberal and secularist agendas. When we see the Film, the Passion we see only some of the sufferings of Christ. I don't think we will ever know what Jesus went through for us, at least not in this life anyway. 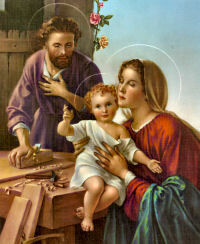 Lord Jesus help us to stay close to You at the Foot of the Cross with Mary, our Mother and the Faithful Disciple John. Let us never despair or lose hope in the Church, despite all the chaos and dissension, and always remember that the gates of hell shall not prevail against it. The Most Reverend Charles J. 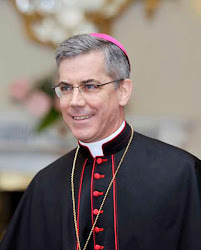 Brown, Apostolic Nuncio to Ireland and Titular Archbishop of Aquileia, delivered the 10th annual Keeley Vatican Lecture entitled "The Catholic Church in Ireland and Pope Francis: Legacy and Transformation". (by announcing this at the Holy Mass) is very wrong but we should pray for the Priest and also for the Archdiocese of Dublin. Link for above video here: Youtube - Outside da Box - How do I go to Confession ? and unborn babies diagnosed with fatal foetal abnormalities. Archbishop Eamon Martin has urged Irish Catholics to “witness courageously to a Culture of Life” as he criticised the exclusion of ‘Pro-Life’ arguments from the debate in Northern Ireland over possible changes to its abortion law. In his homily on Sunday at the baptism of a number of children at St Patrick’s Cathedral in Armagh, the Primate of All Ireland said the Church would mount a “robust defence” of the right to life of mothers and unborn babies diagnosed with fatal foetal abnormalities. He said Catholics should question their politicians over where they stand on this issue. The home of St. John Paul II, home of Divine Mercy, Krakow, Poland. Holy Father's homily given on October 29, 1994 at the conclusion of the world Synod of Bishops on the consecrated life in the Church. 1. <Quia fecit mihi magna.> "For he who is mighty has done great things for me" (Lk. 1:49). Vatican Council II was a "great thing" for the church, which could correctly be defined as the most significant ecclesial event of our century. On the background of this first and fundamental "great thing," given to us by the Lord, other "great things" can be recognized, achieved by him during the recent past. The institution of the Synod of Bishops may surely be placed among these, which by now has its own history, developed during the post-conciliar period. This last synodal assembly can now be recorded in its history, which was greatly expected and—we all hope—not less fruitful than the preceding ones. To the apostolic exhortations <Familiaris Consortio>, <Christifideles Laici>, <Pastores Dabo Vobis> thus now we will have the joy of following with a new post-synodal document, of which we still do not know the <incipit> but which certainly will reflect what has emerged during the course of the assembly, which ends today. There have been weeks of intense work during which consecrated life and its mission have been at the center of reflection and prayer by the church. 2. My soul thirsts for God, for the living God" (Ps. 42:3). The readings proclaimed now contain many lights able to make clear the singular state of ecclesial life which is consecrated life. The responsorial psalm remembers the liturgy of baptism with the blessing of the holy water during the great paschal vigil of Holy Saturday. Baptism is the first and fundamental consecration of the human person. 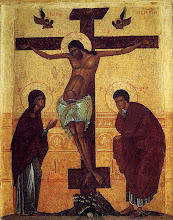 Beginning new existence in Christ, the baptized—man or woman—participates in this consecration, in this total donation to the Father which is proper to his eternal Son. It is he himself—the Son—who incites in man's soul the desire to give oneself without reservation to God: My soul thirsts for God, for the living God. When shall I come and behold the face of God?" (Ps. 42:3). Religious consecration, with its distinct eschatological dimension, is inserted on baptismal consecration. No one has ever seen God (cf. Jn. 1:18) during this life. This is however the beatific vision, that is, the seeing of the visage of God "face to face" (1 Cor. 13:12), the definite vocation beyond time of each man. Consecrated persons have the duty of reminding everyone of this. Faith prepares us for this beatific vision, in which God gives himself to man with the measure of love with which this last one answered to the eternal love, revealed in the incarnation and in the cross of Christ. 3. "For to me, to live is Christ" (Phil. 1:21), writes Paul the apostle. <Amori Christi nihil praeponatur,> St. Benedict proclaims in his rules. <Amori Christi in pauperibus nihil praeponatur,> St. Vincent de Paul will say 1,000 years later. What marvelous strength these words contain! Could one think about culture and European civilization without them? And the great missionary epics of the first and the second millennium, could they be imagined without them? And what to say about monasticism of the Eastern Christian, whose beginnings go back to the first centuries of Christianity? Thus, those who in following the poor, chaste and obedient Christ had abandoned the world, at the same time transformed it. 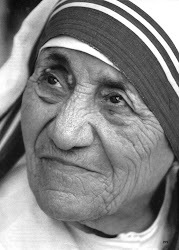 In them was achieved the invocation: "Send forth thy Spirit and renew the face of the earth" (cf. Ps. 103:30). The Holy Spirit knows the "times and the moments" in which one must call upon persons suited for the duties required by the historical circumstances. At that time, he called upon Benedict and his sister Scholastica. 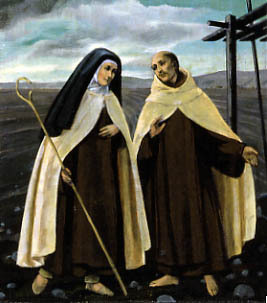 He called Bernard, Francis and Clare of Assisi, Bonaventure, Dominic, Thomas Aquinas and St. Catherine of Siena. From the public squares the Gospel reached the university chairs. At the time of the Eastern schism and the Reformation he called upon Ignatius Loyola, Teresa of Avila, John of the Cross and then Francis Xavier and Peter Claver. With them, a deep spiritual reform was achieved, and the missionary epic in the East and in the West began. During the centuries closest to us the Spirit, which renews the face of the earth, called upon others such as John Baptist de La Salle, Paul of the Cross, Alphonse Maria Liguori and John Bosco, to only mention but a few of the most noteworthy ones. 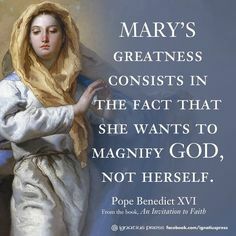 At the end of the last century and during the present, the same Spirit of the Father and of the Son spoke through Teresa of the Infant Jesus, through Maximilian Kolbe and through Sister Faustina. What would the world be, ancient and modern, without these figures—and those of many others? They learned from Christ that "his yoke is easy and his burden is light" (cf. Mt. 11:30), and they taught this to others. 4. We conclude this synodal assembly almost on the eve of the solemnity of All Saints. The Book of the Apocalypse mentions this immense multitude, coming from every nation, people and tongue, standing before the heavenly throne and before the Lamb of God (cf. Rv. 7:9). The significant question follows: "Who are these clothed in white robes, and whence have they come?" From where do they come? we also ask ourselves. Do they not come from the innumerable institutes of consecrated life, male and female, present in the church? The canonizations and the beatifications proclaimed through the centuries give witness of this. The beatifications, which during this month have almost accompanied the synodal way, give particular witness of this. 5. Today, the last Saturday of October, we offer up to you, Mary, mother and virgin, humble handmaiden of the Lord and queen of all the saints, the fruits of the work of the synod. We entrust them to you, queen of the holy rosary, queen of this beautiful prayer which has sustained us day by day during the entire month. Make it possible that these fruits, through a singular exchange of gifts, may be useful also to the cause of the family, complying with the design of divine providence, which desired the celebration of this symbol on consecrated life during the Year of the Family. They praise you, Lord, the consecrated persons. They praise you, the Christian families of the entire world. She praises you, the church, for the gift of the synod. 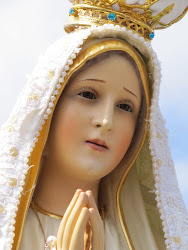 <Magnificat anima mea Dominum> (Lk. 1:46). The more traditional Catholic religious orders are the Orders that are growing in number throughout the world. Young women reject religious orders which have assimilated too much with the world. Many of these diminishing religious orders have forsaken the religious habit and many have also embraced false philosophies such as new age and non Christian philosophies. You can easily see this on their websites which are dull and lacking in any form of Catholicity. Young people will not follow or join a community which has completely lost its own identity. They want a new challenge, something which revives their spiritual lives and asks more of them than the world and all that it offers. They wish and desire with all of their hearts to follow Christ and Him alone. In Ireland we need more religious houses for nuns and we need Novitiates here also. New Foundations which adhere to the Teachings of the Church are badly needed here, particularly orders which are both contemplative and active. 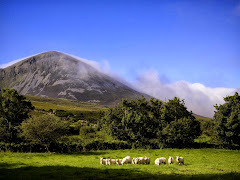 Many Vocations have been lost over the past thirty years here in Ireland because there are very few, especially of the active religious orders which have remained faithful to their original charism and faithful to the Teachings of Christ and His Church. Let us pray for that to change and for new Religious Houses to be set up here in Ireland to renew and also make reparation in our Church. Why would Christ emphasize in our time a doctrine, the Divine Mercy, which has been part of the patrimony of the Faith from the beginning, as well as request new devotional and liturgical expressions of it? 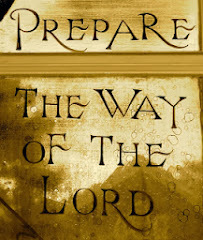 In His revelations to St. Faustina Jesus answers this question, connecting it to another doctrine, also sometimes little emphasized, that of His Second Coming. In the Gospel the Lord shows us that His first coming was in humility, as a Servant, to free the world from sin. Yet, He promises to return in glory to judge the world on love, as He makes clear in his discourses on the Kingdom in Matthew chapters 13 and 25. In between these Comings we have the end times or era of the Church, in which the Church ministers reconciliation to the world until the great and terrible Day of the Lord, the Day of Justice. 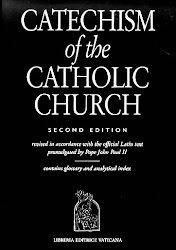 Every Catholic should be familiar with the teaching of the Church on this matter, contained in paragraphs 668 to 679 of the Catechism of the Catholic Church. Only in the context of public revelation as taught by the Magisterium can we situate the words of private revelation given to Sr. Faustina. Tell souls about this great mercy of Mine, because the awful day, the day of My justice, is near. (Diary 965). You have to speak to the world about His great mercy and prepare the world for the Second Coming of Him who will come, not as a merciful Savior, but as a just Judge. Oh how terrible is that day! Determined is the day of justice, the day of divine wrath. The angels tremble before it. Speak to souls about this great mercy while it is still the time for granting mercy. (Diary 635). Today I went to Holy Mass in a city centre Church in Dublin. There were two Priests present, one of them had a walking stick. Both were elderly but the main celebrant was able bodied. At the time of distribution of Holy Communion, two lay extraordinary ministers of Holy Communion came forward. There was absolutely no need for them as there was not a very large crowd at the Mass at Midday. In fact one Priest was sufficient. I was kneeling down at the Priest's side waiting to receive when I noticed one of the extraordinary ministers of Holy Communion finished distributing at his side and came dashing towards us as the Priest continued to distribute. I got up from the altar rails and moved over to the Priest to receive and did so. I might add also that I was not the only one to do so as quite a number followed suit. I felt very strongly today that I would never go to a Lay Extraordinary Minister of Holy Communion again at Mass in any Church. By going to an E.M of Holy Communion, I feel that I too would be a participant in this disobedience. The disobedience is occurring where Extraordinary Ministers are used at every Mass, including early Morning and at all Daily Masses where there is no need for them. This is clearly going against the Teachings of the Church and giving bad example to young people learning about their faith. All of this disobedience and lack of reverence towards Jesus in the Eucharist has led to a decrease in Vocations to the Priesthood and undermines the Priesthood itself and the Sacredness of the Vocation as well as the Sacredness of the Holy Mass. We all have a part to play in renewing our Church and each one of us can do something no matter how small to restore the Priesthood and the Respect due to Christ in the Eucharist and to also make reparation for all the offenses against Jesus in the Most Blessed Sacrament. I know there are very good people who do this work in the Church but as it says above, they are 'extraordinary' and should not be used at every Holy Mass as they now are. 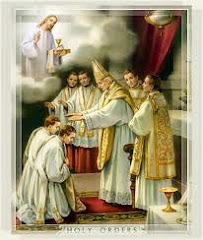 There should be no rush to receive Holy Communion and by having one Priest distribute, it gives more time for reflection and thanksgiving and would bear greater fruit for the Church.. Our Church has become over laicized and this is contributing to the lack of Vocations to the Priesthood. So please let us all reflect more on Who we receive at Holy Communion and become more familiar with the Church's teaching on the Sacraments and the Priesthood. The UK Catholic Church has a higher number of Vocations to the Priesthood and Religious life than Ireland. They also have a greater emphasis on proper Catechesis and training for young Catholics. Since the visit of Pope Benedict XVI (now Emeritus), vocations have bloomed. The Video above ends at about 14.30 minutes with questions on the content of the Video put up afterwards. Its a very powerful video. God bless all those who participated and who produced this wonderful resource. Lord Jesus Christ, Savior of the world! We humbly beg of You to manifest in Your Church the Spirit Whom You did so abundantly bestow upon Thy Apostles. Call, we pray You O Lord, very many to Your Priesthood and to the religious life. And may zeal for Your glory and the salvation of souls inflame those whom You have chosen; may they be saints in Your likeness, and may Your Spirit strengthen them. O Jesus, give us priests and religious according to Your own Heart ! O Mary, Mother of Jesus! 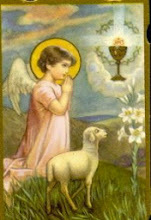 Obtain for fervent souls the grace to hear and the courage to follow Your Divine Son in the path of religious perfection. 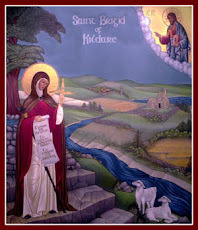 Let us today begin to pray for Holy Vocations to the Priesthood for Ireland especially. Pray for your Diocese, your Bishop and your Priests. Encourage and pray for all young men in your Parish. 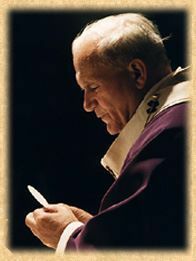 Don't push the faith on them, give witness, invite them to retreats, days of Prayer, provide retreats in your Parish, provide Days of Prayer for young people, encourage more Confession, show a good video on the Saints, the Church, the Priesthood in your Parish, have a Holy Hour of Adoration devoted to Priests and Vocations. Light a candle each day to the Lord of all Creation, who continues to call men to the Priesthood. Give Him the chance to get through to them. Pray the Rosary, the Chaplet of Divine Mercy and to the Saints to send more men to the harvest. Have the Holy Mass offered for this intention also. There are so many ways to pave the way for the Lord to reach those He is calling and it is up to each of us to make an effort to do something through prayer and action for the Church and ultimately for Christ and His work of salvation. Lord Jesus, as you once called the first disciples to make them fishers of men, let your sweet invitation continue to resound: Come follow me! Give young men and women the grace of responding quickly to your voice. Support our bishops, priests, and consecrated people in their apostolic labor. Awaken in our community a missionary eagerness. Lord, send workers to your harvest and do not allow humanity to be lost for the lack of pastors, missionaries, and people dedicated to the cause of the Gospel. Mary, Mother of the Church, the model of every vocation, help us to say “yes” to the Lord who calls us to cooperate in the divine plan of salvation. Amen. From Poland...new authentic Catholic groups rising and giving a powerful public witness to the Faith. I know many people now perhaps buy their books online. But if you wish to find good Catholic books on the street, you may be surprised to find them at the Bible Booksellers on Dawson Street, Dublin 2 where you will find quite rare books as well. There they have a vast supply of Bibles both Christian and Catholic. I found today the old 1966 version of The Jerusalem Bible which I purchased. 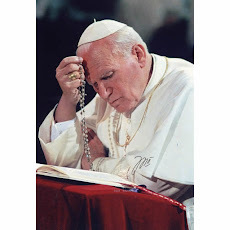 So if you want to find many of Pope Benedicts writings, St. John Paul II's writings as well as writings from the great Saints, good prayer books, a big selection of Scripture study books (various Christian writers as well as Catholic), books on the Liturgy, Divine Office etc etc. It is a fascinating old bookshop which is very easy to browse around and there is an excellent service there available if you want to order books. The staff are very friendly and helpful if you have problems finding a book. They also take some second hand books as well. Beautiful Images of the Catholic Faith in Wroclaw, Poland. Beautiful video. I found this statement on the Parish website of Ramsgate and Minster in England. I think it is a vision for all Parishes to take on board. Bishop Mark Davies has dedicated 2015 as a “Year for Vocations” in the Diocese of Shrewsbury, which includes vocations to marriage and family life as well as the priesthood and religious life. 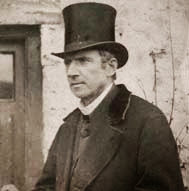 Bishop Davies said: “We believe that the union of husband and wife, expressed in the union of one flesh, must always be open to new life, to the children God may entrust to the couple. We believe sexual relations belong within marriage alone. And we believe we are all called to chastity according to our state in life. Indeed, it is by living the beautiful virtue of chastity that we ensure we use this gift of sexuality in accord with God’s purpose. 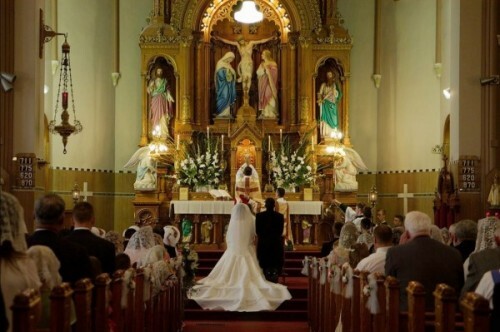 We believe that, as is true of the Sacrament of Matrimony, both virginity for the sake of the Kingdom of God and apostolic celibacy are also God’s gifts. May the Lord bless Bishop Mark Davies, a true Shepherd to his people. I always look forward to his homilies and teachings. I hope that more would be done here in Ireland for Vocations most especially to the Priesthood. 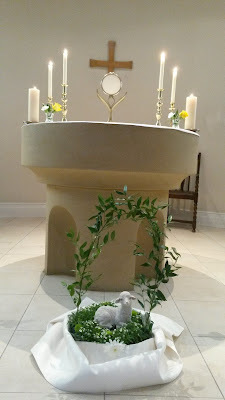 My own small efforts at encouraging vocations is a blog called Come Follow me, here http://comefollowmesaysthelord.blogspot.ie/ and also through daily prayer and lighting a candle for a holy Vocation to the Priesthood each day. In the midst of a turbulent world and constant 'bad news' it is wonderful to see the joyful faces of those in this video from so many countries who have benefited from the charity 'Mary's Meals'. This is such an uplifting sight to see, to see children dancing and smiling with overflowing joy at receiving such simple gifts. May the Lord bless this great charity in abundance in the coming year and Magnus MacFarlane-Barrow especially, and each and every volunteer that helps in bringing new life and hope to so many in need around the world. God’s sign is his humility. God’s sign is that he makes himself small; he becomes a child; he lets us touch him and he asks for our love. How we would prefer a different sign, an imposing, irresistible sign of God’s power and greatness! But his sign summons us to faith and love, and thus it gives us hope: this is what God is like. He has power, he is Goodness itself. He invites us to become like him. 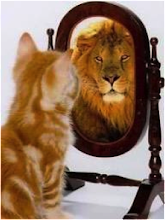 Yes indeed, we become like God if we allow ourselves to be shaped by this sign; if we ourselves learn humility and hence true greatness; if we renounce violence and use only the weapons of truth and love. Only if people change will the world change; and in order to change, people need the light that comes from God, the light which so unexpectedly [on the night of Christmas] entered into our night. Have a very blessed and Holy Christmas Season......keep close to Jesus at every moment. He is always with us. "We are now standing in the face of the greatest historical confrontation humanity has ever experienced. I do not think that the wide circle of the American Society, or the whole wide circle of the Christian Community realize this fully. We are now facing the final confrontation between the Church and the anti-church, between the gospel and the anti-gospel, between Christ and the antichrist. The confrontation lies within the plans of Divine Providence. 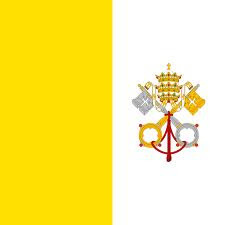 It is, therefore, in God's Plan, and it must be a trial which the Church must take up, and face courageously." 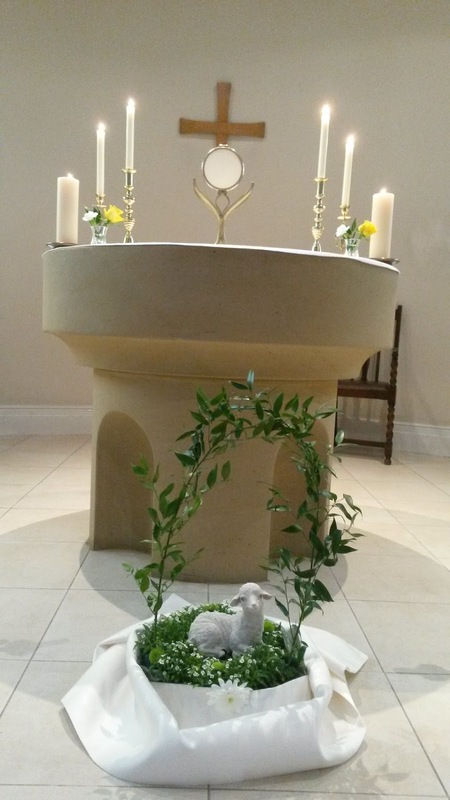 Please pray for the restoration of the Permanent Diaconate in the Diocese of Killaloe. We ask Our Lord to forgive us and to help us to restore this Sacred Vocation in the Church to those who He wishes to call. It is a Call from Christ and we should never put obstacles between Christ and a Soul He wishes to call to Himself to serve in the Church otherwise we will answer to Christ for the loss of Vocations and Souls. We also pray for the new Bishop who will take over the Diocese next year, whoever he may be. We pray also for Bishop Kieran O'Reilly in his new ministry as Archbishop of Cashel/Emly. May God bless him abundantly in his new Diocese. We will pray the Chaplet of Divine Mercy for this every day. MY GOD, I believe, I adore, I trust, and I love Thee! I ask pardon for for those who do not believe, do not adore, do not trust and do not love Thee. The Church, my friends, does not live because of offices, committees and structures (as important as these may be). She lives by the presence of Jesus Christ – our Way, our Truth and our Life. And his presence is experienced in many ways, but most powerfully in his word and in his sacraments – above all, in the sacrament of the Holy Eucharist. Apostolic Nuncio Charles Brown accepts Breen’s invitation to visit Clare. 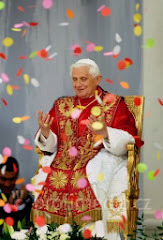 'The Holy Father (now Pope Emeritus Benedict XVI) recommended that we study the Catechism of the Catholic Church as part of the Year of Faith. He described the Catechism as a means of encountering the person of Christ. 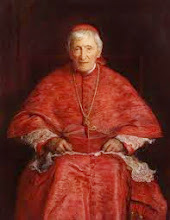 Remarkably, he wrote “on page after page, we find that what is presented here is no theory, but an encounter with a Person who lives within the Church” (Porta fidei, 11). That Person is Jesus Christ, God made man'. Ex Umbris Et Imaginibus - Congratulations, Bishop-Elect! 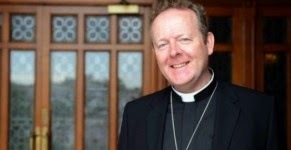 Irish Catholic - Monsignor Eamon Martin named as Coadjutor Archbishop of Armagh. Please keep up the Prayers for Life - Abortion is a Crime against Humanity. O Father, raise up among Christians numerous and holy vocations to the priesthood, to keep the faith alive and guard the gracious memory of your Son Jesus through the preaching of his word and the administration of the Sacraments, with which you continually renew your faithful. Call ministers of your mercy,who, through the sacrament of Reconciliation, spread the joy of your forgiveness. Grant, O Father, that the Church may welcome with joy numerous inspirations of the Spirit of your Son and, docile to His teachings, may she care for vocations to the ministerial priesthood and to the consecrated life. Sustain the Bishops, priests and deacons, consecrated men and women, and all the baptized in Christ, so that they may faithfully fulfill their mission at the service of the Gospel. 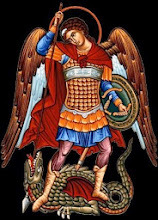 This we pray You through Christ our Lord..
St. Michael the Archangel, defend us. Benedict XVI: I'm not a man who constantly thinks up jokes. But I think it's very important to be able to see the funny side of life and its joyful dimension and not to take everything too tragically. I'd also say it's necessary for my ministry. A writer once said that angels can fly because they don't take themselves too seriously. Maybe we could also fly a bit if we didn't think we were so important. 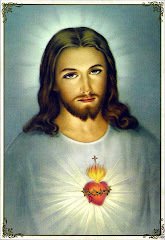 Eternal Father, I Humbly Adore and Thank You, for having Created me, and for having Redeemed me. I Thank You for having made me a Christian, by giving me the True Faith, and for Adopting me as Your Child in Baptism. I Thank You for having given me Time-to Repent, after my many Sins, and for having Pardoned all my Offenses. I Renew my Sorrow for them, because I have Displeased You. I Thank You also for having Preserved me from Falling-again, as I would have done, if You had not Held me up, and Saved me. But my Enemies, do not cease Fighting-against me, nor will they, until I Die. If You do not Help me Continually, I will Lose Your Grace again. I, therefore, Pray-for Perseverance till Death. Your Son Jesus, has Promised that You will give us whatever we Ask-for in His Name. By the Merits-of Jesus Christ, I beg You, for myself and for all those who are in Your Grace, the Grace-of Never-more being Separated-from Your Love. May we always Love You in this Life, and in the Next. Mary, Mother of God, Pray to Jesus for me. So I Hope. So may it be.